LANCASTER – A dead man found stuck inside a brick pillar at a Lancaster supermarket may have been a man on the run from sheriff’s deputies, who disappeared Aug. 6, according to media reports. 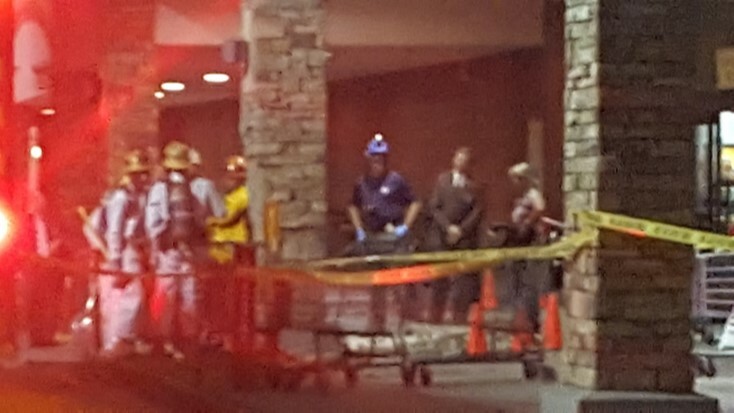 The body was found about 2:40 p.m. Saturday, Aug. 11, inside a pillar at Winco Foods, at 740 West Avenue K, sheriff’s Lt. John Corina confirmed to reporters. Deputies were reportedly chasing the man on Monday, Aug. 6, when a witness says he ran into the supermarket, sprinted up stairs into the offices, and then hid in a crawl space. Henry Oliver, a witness, told CBS2/KCAL9 that he saw the man run into the store. 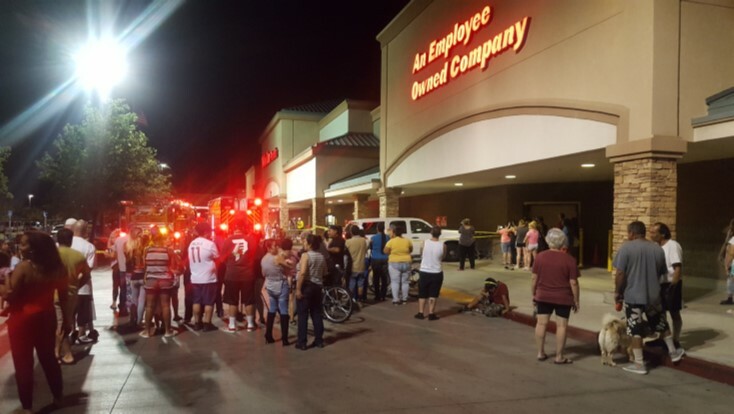 Six days later, a store manager complained about a strong smell Saturday morning. A plumber was called and a couple of bricks were broken to look inside the pillar. The man’s name will be released pending notification of next of kin, according to the coroner’s office. Sheriff’s homicide detectives are asking anyone with any information regarding this incident to call 323-890-5500. UPDATE: The deceased has been identified as 35-year-old Raymundo Rivera. Read an update here. 58 comments for "Body found in pillar may have eluded deputies, got stuck inside a crawl space"
Horrible way to die he didn’t deserve to die that way may he rest in peace condolences to the family. The person whose car he stole didn’t deserve that either. I’m still trying to figure out why there is a hollow pillar in the 1st place. And why there is access to it from an office area. Agreed the store should have closed as to clean the area properly, but a profit is more important I guess. Someone asked where the K9 was. I can answer that the City refuess to pay for a dedicated K9. Listen to the scanner and it’s asked all the time. The response is no K9 is monitoring. The K9 suv that is seen is either the one for the train or the SEB dog. The city feels the dog is not important, although Lancaster handles the most calls for service with Palmdale a close second. helicopter same, city nor the county see a dedicated need for one. It isn’t accessed from the office area directly. Commercial retail buildings have a facade that supports the signage and appeals to the parking lot. It’s basically like an attic; accessible but not meant for occupancy; full of AC ducts, electrical conduits, plumbing…and dust, lots of dust. Since it isn’t intended for occupancy there’s no flooring, and if you don’t step on the joists you might crack the exterior stucco, so the people who have to work in there are careful. Once a building is in use that generally just means guys from sign companies who have to get in there when “Bill’s Grocery” goes out of business and the new “Bob’s Grocery” wants a new sign on the facade. Sometimes they’ll lay down a plywood “catwalk” on the joists, but just in the area where they have to work. As to the column; the framing of the column supports the framing of the building. It’s a lot cheaper to build a column framed with 2×4 or 2×6 lumber and wrapped in stucco (or slumpstone or whatever kind of siding) than it is to use some big chunk of solid lumber, and is actually superior structurally. It also allows for the size of the pillar to be whatever the architect thinks looks good, rather than just being a solid wooden post of whatever size can take the weight. Haven’t they identified the man yet and I would be interested in knowing the cause of death. Could be dehydration, heat stroke or a heart attack brought on by panic once he realized he was stuck and couldn’t move. He is a pillar of the community. I cannot believe that I walked by a corpse with my wife and toddler. WinCo and the police need to be held accountable for this. In any other small town in America this would be scandalous but, everyone is reacting like it is not a big deal. Californians- permanently blind. This place is a real dump and SoCal only has money because of the defense industries, oil, and B-movies. I also walked by this with my children, twice to be exact. To blame Winco is ridiculous. The store is in no way responsible for this man making poor choices. I agree the sheriff’s shouldn’t have given up looking for him so soon. This will not stop my family or me from shopping at Winco. Californians always want to sue someone. You are a good example of that Dr. Bad guy runs up on a roof and chooses a spot to hide that does not work out for him. Soooo…lets sue the building owner, the cops, the brick maker that made the pillars and so on. Crazy thing is, they would probably win on all those suits. P.S. How do you know you walked past a corpse? Maybe he was still alive then. You should have known it and helped. Maybe they should sue you for not doing anything. I’m not a Californian. Its called oversight and responsibility. You know like when your child does wrong and you try to explain to them that what they did was a mistake. So that they do not make the same mistake again. And yes, the smell was quite bad when I walked by with my family. Your second part of the argument is stupid. But the story is scandalous and that’s why it is making nationwide news. Its gross negligence not bad luck. Your whole premise is as you stated “stupid”. I can’t believe you are not a Californian. I hope you are not spreading the Californian virus to somewhere else. If so, stay toward one of the coastlines. They are already infected. If you are not from there…..why the heck would you be visiting Lancaster? Did your GPS take you on a wrong turn? I hope you are not suing your kids for doing wrong. Do you try to teach them right from wrong by explaining things or telling them be careful, in California you will get sued for not exercising oversight and responsibility? You watch too much TV doctor. Every comment you make has the word scandalous. Just like the media. We don’t know what condition he was in. Did he fall down the column did he think he could crawl out and then found out he couldn’t. Did he scream for help and he couldn’t be heard? I heard somewhere his arm was wedged around his body so he probably could not crawl out or just the sheer heat caused him to pass out pretty fast. Our temperatures have been well in to the 100’s of degrees. Quit blaming the cops and the store. They had no idea he was in that column. They thought he got away. This is the most winning comment ever! Winco has nothing to do with this .You can feel free to stop going there if you want .stop blaming the store . You were not the only one . Lancaster is a big let down. Lancaster and WinCo are both poorly run and this article (and the various others carried nationwide) highlights why. That a dangerous criminal entered the store and they did not close. They state to be employee-run but, that is old school ruthlessness. Someone told put all of those minimum wage workers to stay and get back in there and work. Then, local PD employs infrared and $2K an hour helo’s but, no $220 a month K9 unit on site to find the dangerous criminal. Furthermore, the store and the county has failed to properly clean up the site. It still smells like the corpse is there or like there’s a foot and eyeball caught in the rafters. All this pretty much happening right by a Target, Applebee’s, a Panera Bread shop and the mayor’s office (a well-to-do mayor at that). In ANY OTHER TOWN in AMERICA this would be scandalous. Any other town especially, a small town. And I know, I’ve been stationed everywhere. Its such a freak show out-West. Everything is backwards and idiot-supervised. CA only has money because of the weapons industry, oil and B-movies. Other than that SoCal is a real dump with the worst Americans. You guys sure found a way to screw up paradise. I’m like the other 8 out of 10 people here in the entire state who’s just here for the money. You sound like a hateful trump supporter, if you don’t like Ca move! Its sad that you defend such a defunct and failed place. I guess if you have any kids or maybe a niece do you really want this for them as a future? You act like things don’t happen in other places? What is your doctoral degree in? …Honestly, you don’t seem that bright to me. Were you granted a doctoral degree from University of Phoenix or something? You seem like another unhappy, money-driven Republican who just looks out for themselves. Dr. If you are one, which I seriously doubt. I Think you are the FREAK SHOW! So Dr of decomposition and responsibility. Please Spare Us Your Anntics On Responsibility’s. [removed] HAPPENS! In My Humble Opinion. Dr you are a GREAT example of That! Your slack attitude is a perfect example of why your schools are in the dumps, your kids (if you have any) hate you, there’s no middle class and some poor kid died slowly in a community grocery store. Oh, and 2 more words- Homeless Population (and on epidemic proportions). Very few cities outside of Cali and the West Coast can boast of these chronic problems. All you other people with you’re rude comments keep them to you’re self.because the man does have a family .and daughter.the man wasn’t a bad person he was scared.of never seeing his family.again.and when you can’t see well and it’s dark.thats what happens . And nobody was doing there job right.it should have. Never taken them that long to find him.and now there’s a little girl with no daddy. Her every thing gone…. Are you an idiot? Now its the cops fault because they didn’t find him down a pillar lmfao. It’s not his fault at all for running from the police. Its called Self responsibility he chose to run so quit trying to play the blame game. Yea, he was a real stand-up guy. hmmmm….maybe this douchebag should have just complied with deputies instead of running……or MAYBE he should have never should have committed a crime in the first place. Make NO MISTAKES…HE the only person responsible for the suffering of his children. Who is they? Cause if your referring to the store who would think he was in the column and look for him there? Darwin Award winner right here. Or, you could say he was a pillar of the community. Wow, someone pretending to be me that actually said something clever. Props to you! I doubt it was original – same comment was posted on Usa Today site – it was national news because it was such an odd story. Still a step up. Usually the people who pretend to be me seem to be trying to say the stupidest thing possible. They also generally can’t spell and don’t understand basic grammar either, so this one is clearly a cut above. The superlative form of stupid is most stupid, as in “I made the most stupid mistake,” not stupidest. Stupidest can be heard and seen everywhere, but it is wrong. The comparative and superlative forms for adjectives are determined by the number of syllables in the root word. A single syllable, such as ‘big,’ always has a suffix applied, as in bigger and biggest. Three or more syllables, such as ‘beautiful,’ will always be modified using ‘more’ and ‘most.’ Two syllable adjectives, such as stupid, fall in between these two hard and fast rules. Therefore most dictionaries recognize both forms as correct. Criminals are not known for being intelligent , hard to feel bad for someone who commits a crime puts the public in danger by going on a pursuit , sorry not sorry! I see people blaming the police and the store but not the person who committed a crime. The person that committed the crime payed the ultimate price, in a painful way. Wow! They quit looking for him after he ran into the grocery store but no evidence he ever left. No K-9 unit available? Then WINCO stayed open. Winco should have closed to decontaminate the pillar for at least 24 hours. Maybe it was shift change for those deputies. Note to self: When trying to escape the police, find a roof. Apparently they’ll just stop looking. Im pretty sure I’ve done this in GTAV before. Wondering where was our Eye in The Sky! Probably patrolling the R. Rex Parris Law Building.Probably patrolling the R. Rex Parris Law Building.Which he bought illegally.Which he bought illegally.LEAPS is a waste.LEAPS is a waste.$10 Million Tax Payer dollars a year.$10 Million Tax Payer dollars a year.For nothing.For nothing.Crime goes up.Crime goes up.So does Rex’s friend’s bank account.So does Rex’s friend’s bank account.No to LEAPS.No to LEAPS.Yes to Sherriffs.Yes to Sherriffs.More boots on the ground.More boots on the ground.No to LEAPS.No to LEAPS. turd ferguson-why do you repeat yourself like that? No judgement just curious. It’s part of his “Leaps is redundant” schtick. I gotta hand it to him. He’s dedicated to it. LEAPS is a waste of money.LEAPS is a waste of money.We already pay for the Sherriff’s heliocopter.We already pay for the Sherriff’s helicopter.We are paying twice.We are paying twice.The Sherriff’s heliocopter works.Tje Sherriff’s heliocopter works.LEAPS does not.LEAPS does not.It only sends money to Rex’s political pal.It only sends money to Rex’s political pal.$10 Million Tax Payer dollars.$10 Million Tax Payer Dollars.No to LEAPS.No to LEAPS.Yes to Sherriff’s.Yes to Sherriff’s.More boots on the ground.More boots on the ground.No to LEAPS.No to LEAPS. I see. I see. Thanks. Thanks. Turd Ferguson rocks! Turd Ferguson rocks! Why does a building have an opening to a 20 foot long, hollow pillar, in the first place? Why is there no way out? What’s the purpose of being hollow? What a horrible way to lose your life!! The facade of a commercial building has no reason to be finished on the inside. The only people who should ever be in there are people who have business being there and know what to expect, most notably the people who install and maintain the lighted signs on the front since the power is routed through there. As to the question “what’s the purpose of being hollow?” the obvious counter is “what would be the purpose of NOT being hollow?” The pillar has to carry a load, period. As long as it can carry the designated load it is adequate, and after that it’s just a question of what you want it to look like. Since nobody likes spindly little stick pillars, bigger hollow pillars are normal. Right….? The lack of logic from some of the people who post here is astounding to me? So, they should start manufacturing columns differently, and installing them differently, so that POS people like this guy can hide easier and not be suffocated? …Seriously????? You gotta be kidding!!! To bad the POS didn’t feel that way about the kid he nearly killed on Lancaster Blvd, right??? Who is this kid he nearly killed on Lancaster Blvd? Where did you get this information? How sad! What a terrible way for him to die.